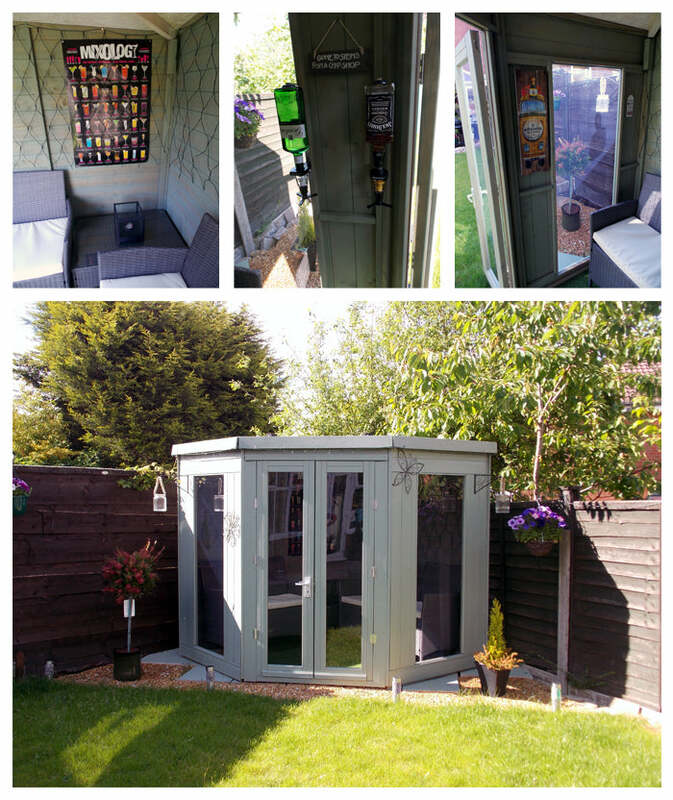 A Summerhouse is the ideal place to sit, relax and indulge in some of your favourite hobbies and pastimes. Decorating it to reflect your personality and style is the way to create that extra special space you’ll want to spend all your free time in. Whether you’re after a country cottage feel, beach-inspired retreat, or an up-to-the-minute zen-den to escape to, we’ve got lots of ideas and inspiration to help you on the way. Here are our top 10. 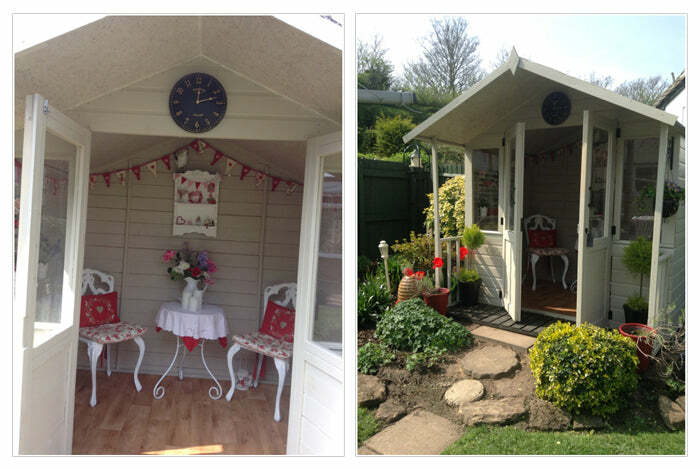 A huge thank you to our customers for sending us their photos of their Waltons Summerhouses. Check out this corner summerhouse here! Think nautical, and bring a piece of the seaside home with a beach-themed hut. A colour palette that includes subtle shades of blue, white and green will create a relaxed vibe that is just as easy to carry over into the upholstery you use. Choose fabrics with seaside themed patterns. Then add in splashes of bright colours such as ruby red and pink on your cushion covers, throws or tablecloths. Why not get really creative and use shells that you’ve found on the beach, strings of white fairy lights and even model boats? Walton’s customer Sue has even included some deck chairs and palms for a real beach feel! You can find this Sussex summerhouse here. Nature lovers will adore this idea for a woodland retreat. Keep the exterior of your summerhouse natural with a simple wood stain rather than a block of colour. Vibrant touches of colour and contrasting textures are created with the addition of hanging baskets to the outside. Choose earthy shades of moss green or brown for your interior fabrics, and think about using accessories that feature forest creatures, like hedgehogs or foxes to compliment. Sheer curtains are ideal in a woodland retreat, and will protect you from the heat of the mid-day sun, and add in an relaxig, diffused light. If you have a country garden, consider a vintage style summerhouse to complement it. The shabby chic look is easy to achieve, and uses soft colour schemes including shades of cream, light pink and pastel green. Perfect for calm, relaxed styling. Paint the exterior in one of these tones and use a different hue in the interior. Pale coloured accessories such as vintage milk jugs or antique vases will look beautiful filled with fresh flowers from the garden, adding colour and depth. 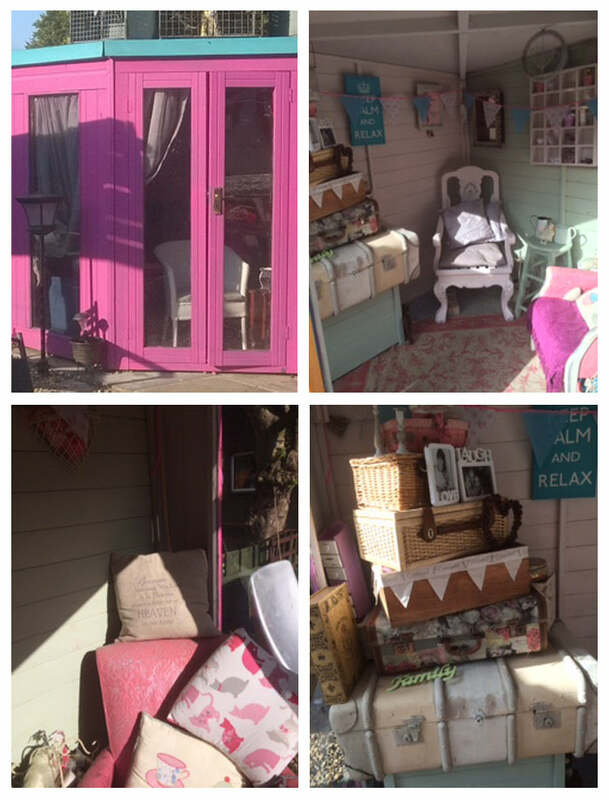 Styling a vintage style summerhouse also means you have a great excuse to spend time at car boot sales or secondhand shops seeking out the best pieces of furniture. 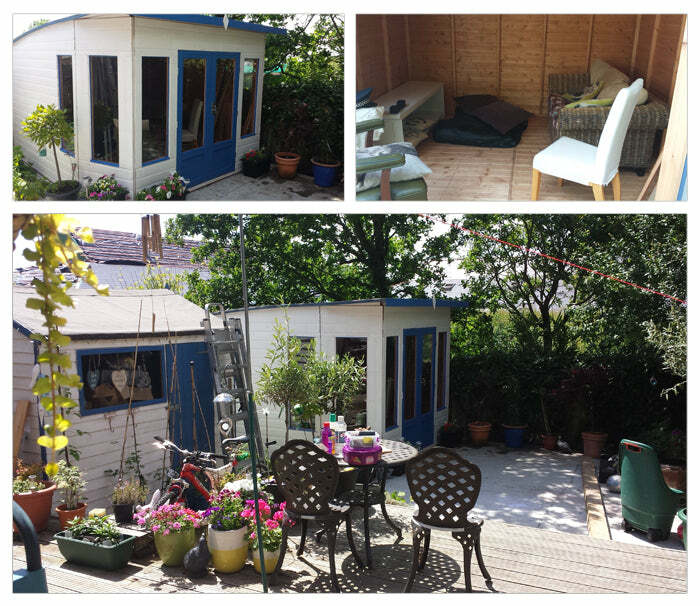 Create a haven of calm with a summerhouse based around a blue colour scheme. Noted for its relaxing properties, using varying shades of blue gives an air of tranquility to any summerhouse. On the exterior, opt for a light blue colour wash, then balance this by painting the trims of the door in white or cream. Inside, keep the decor bright with white paint, and use blue accessories in pale shades to add interest. Furnish with blue checked cushions or breton striped throws over a garden bench and matching chair. A brightly coloured vase with fresh or faux flowers in it adds depth and breaks up the scheme beautifully. The Contemporary Summerhouse with Side Shed is a popular and versatile choice. Fancy something really cutting edge and modern for your summerhouse? Choose a building with a modern look, and paint it in a colour that complements your existing garden scheme. Our customer here has used a combination of green and cream for their house. For the interior, create a space that can be used all year round. Comfy leather reclining chairs and a table in a dark shade of brown or black give a timeless look. Pair these with brightly coloured and patterned cushions. Adding in some speakers and spotlights makes your retreat somewhere you can relax to your favourite music. Solar lights on the exterior give a warm light, and an eco-friendly touch! This Corner Summerhouse gives you a light, bright space to customise. Want to entertain friends and family in style, but don’t have a lot of garden space? A corner summerhouse, gives you ample room and comfort - but doesn’t take up the entire garden. Turning it into a brilliant place to entertain is easy. Fit it out with some comfy chairs, like rattan sofas. Battery powered fairy lights will add a touch of elegant glamour, as well as handy evening light. For a unique touch, why not find some reclaimed bar taps to hang on the wall, or put up some quirky artwork or posters to make the interior feel like a cosy pub? This is one of the boldest Corner Summerhouse decorations we've seen! Go bright and bold with a striking summerhouse that makes a statement. An exterior in a lively shade of fuschia pink, with edges trimmed with a contrasting green makes for an eye-catching garden room. Create a vintage-inspired look inside by using a mix of plain coloured patterned cushions on brightly coloured chairs. Vintage suitcases can make a clever storage solution - or even a table. Some playful bunting adds a touch of lively fun. This Summerhouse holds a back-room bar surprise! How about a summerhouse that surprises anyone who visits it? From the outside, it’s a pretty and relaxed space to entertain. There’s a covered outdoor seating area with a wooden gazebo and trendy rattan furniture. Take a step inside to find a friendly, pub style hideaway with a cool mini bar, dart board and mini fridge to keep drinks and snacks ice cold and fresh. The contrast between quiet refinement outside and friendly relaxation inside works especially well for couples who entertain regularly, and who want the best of both worlds when their friends come to stay. How does your summerhouse grow? Every English country garden needs a summerhouse to make it that extra bit special. Paint the exterior of the house in a soft shade of blue, using a complementing shade of cream to highlight the door frames. Hang some matching bunting from the roof and use some reclaimed crates and tins to give a relaxed and homely atmosphere. The exterior of the building is the best place to display all your favourite garden plants. To give it a really rustic feel, find different coloured plant pots, made from a variety of materials like terracotta or wood to add depth and texture. An old stepladder creates the perfect feature for your plants, just as our picture shows. 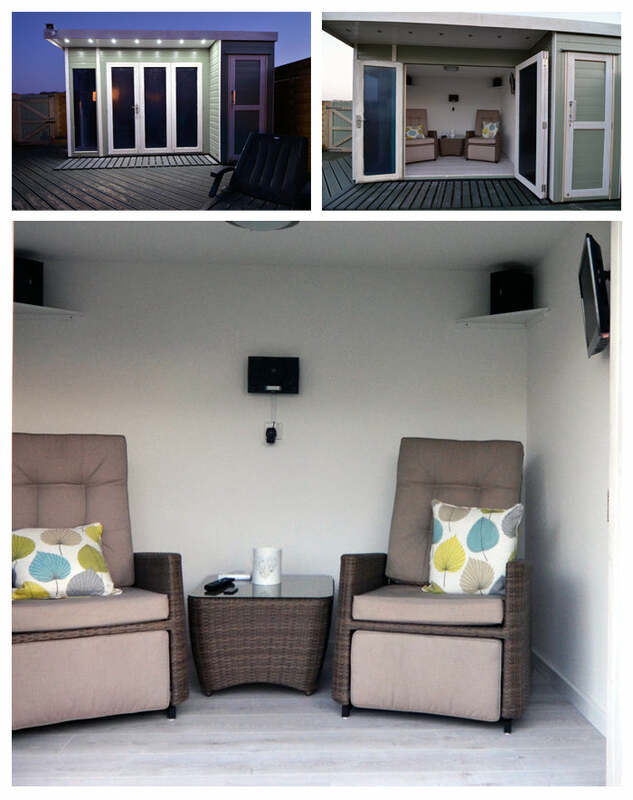 Our Helios summerhouse is the perfect hideout space! What teenager wouldn’t like their own den to hide away in? 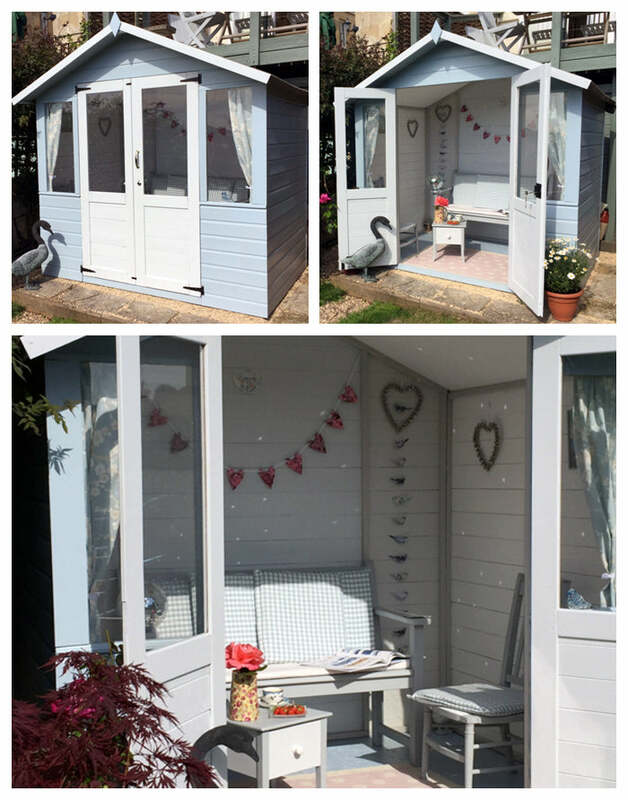 Walton’s customer Kim created something special for her teens with her summerhouse. It’s something you can get the kids involved with too, as they can figure out their own colour scheme and go shopping with you to get the right accessories for their hang-out space. Hook it up to electricity (get a professional in for this!) to power the Wi-Fi, television and those all important speakers so they can play games, listen to music and watch TV to their heart’s content. Inside, some DIY bean bags and folding chairs and table make for easy storage and tidying. Recycle! Don't blow your budget on decor; scout out bargains at car boots and on sites such as FreeCycle and Ebay. Furniture can be transformed with a clean and a lick of paint. Folding tables and chairs are a good option because they are lightweight, easy to store and can be brought out quickly when you're entertaining. Remember the floor! Protect your floor with an off-cut of lino or carpet. Quick, cheap and easy! We hope you’ve been inspired by our selection of ideas for how to make a summerhouse special. We’d love to hear your ideas on how you’ve made your own retreat look unique - so do get in touch, show us your pictures and tell us your stories on our Facebook page!